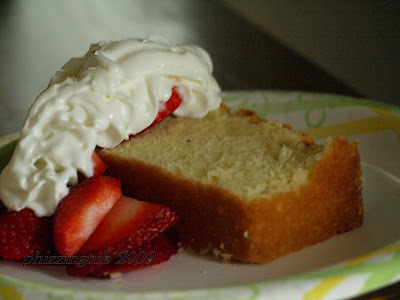 I wanted to try out a new pound cake recipe but once I stated to get all the ingredients I found that I was missing one item. I decided to pull out my old recipe that I have used since I was in high school. It creates a wonderful cake that is perfect with any type of berry and whipped cream; then again you can always eat it by itself. You will be impressed at how easy it is to make and sure to please. Work butter until creamy, beat in sugar, vanilla, eggs one at a time. When creamy, fold in flour with a wooden spoon. Spread into a buttered and floured loaf pan. Per Serving (excluding unknown items): 420 Calories; 21g Fat (44.8% calories from fat); 6g Protein; 53g Carbohydrate; 1g Dietary Fiber; 156mg Cholesterol; 223mg Sodium. Exchanges: 1 1/2 Grain(Starch); 1/2 Lean Meat; 4 Fat; 2 Other Carbohydrates. How large you slice the cake will determine how many servings you will end up with. You can use any other flavor in place of vanilla.